Love is in the air! With Valentine’s Day fast approaching, we often find ourselves reflecting on our recent wedding and Honeymoon trip to Walt Disney World. One of the highlights of our trip was eating and drinking around the world at Epcot. 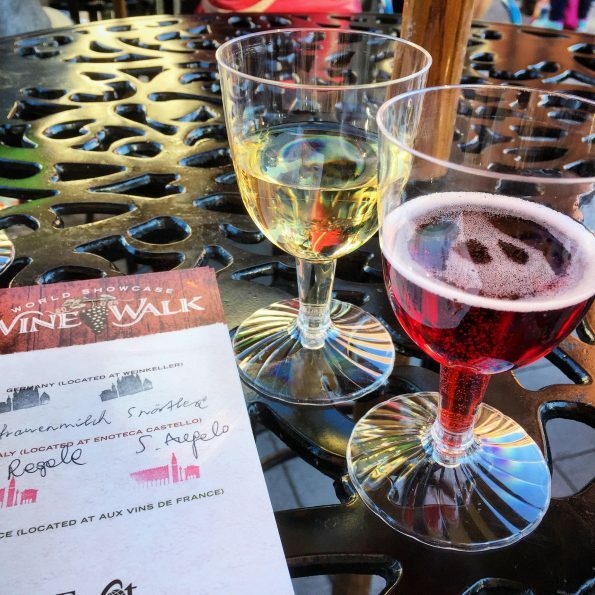 During our time at Epcot, we decided to do their World Showcase Wine Walk which featured wine tastings in Germany, Italy, and France. One of the wines we tried in Italy was Rosa Regale. The unique sparkling red wine intrigued us and was definitely a highlight of our time in the Italy Pavilion. 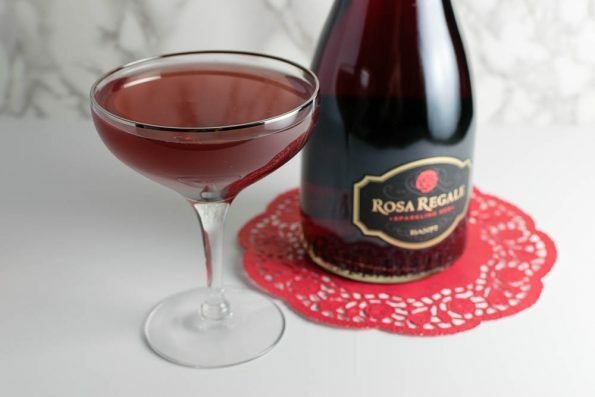 When Rosa Regale reached out to us to create a Valentine’s Day-themed cocktail, we were so excited when we realized it was the same sparkling wine from our Honeymoon. Rosa Regale has notes of strawberry, raspberry, and rose. We noticed that a lot of recipes already created for Rosa Regale featured vodka. While we were testing various cocktail recipes, we tried a few different spirits but ended up going with gin. Our gin cocktail adds a bit of a herbaceous note to the sweet flavor of Rosa Regale, which tones it down for the cocktail lover who isn’t crazy about overly sweet drinks (like us). This cocktail really holds a special place in our hearts. Every time we make it, we will now think of our wonderful Honeymoon. We hope that when you make it, you will share in our love! What cocktails hold a special place in your heart? Why? Leave a comment below or use the hashtag #GeekEats. Happy Valentine’s Day! Stir first four ingredients over ice. *The Geeks were compensated to facilitate this write-up; We were also provided information about Rosa Regale. All opinions are wholly our own. View our Disclosure Policy for more info. I love Rose Regale, just how it is. I can only imagine how good it would be in this cocktail! Perfect Valentine’s recipe– thank you! I’ve never heard of Rose Regale, it sounds really interesting though. Such a pretty looking cocktail! 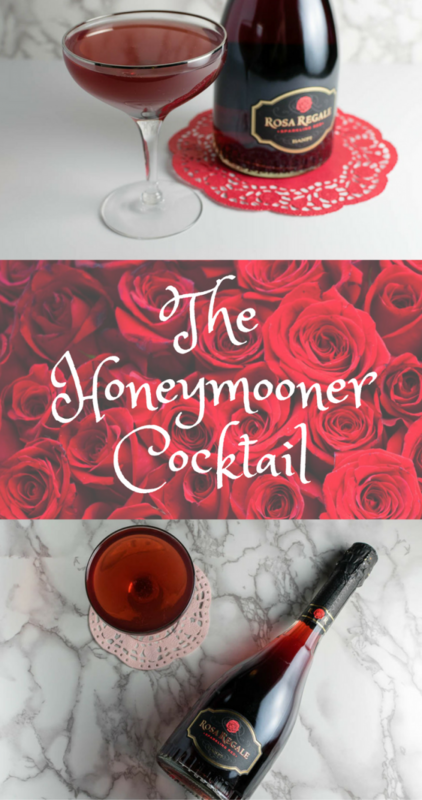 Whew this cocktail looks like its definitely going to give you that honeymoon feeling *wink wink* I’ll have to try this one out this valentines day. The notes in this wine sound like its a definite hit wether you turn it into a cocktail, or just drink straight from the bottle! I need a bottle of Rosa Regale! Looking divine that drink! and romantic! Sounds like a great cocktail for adults! What a beauty, I love the idea of a Valentine’s cocktail with a cherry liqueur and Rosa Regale. What a great and tasty way to remember your honeymoon. Food is such a great memory maker, and you certainly have shown it here. Perfect way to celebrate Valentine’s Day. Not an alcohol guy but I do love how well taken your pictures are. Thanks for sharing! I can use a glass now. The pic is drool worthy. I realize it’s still quite early in the day, but my Friday could use about three of these! Sounds like my kind of drink. I’m heading to WDW in a few weeks so I will have to try the Rosa Regale at Epcot – thanks for the tip! This is a lovely representation of something that’s delicious and meaningful!! I love gin cocktails and this one sounds very nicely balanced. I’ll have to keep a look out for this sparkling wine.